Variable Spring Supports Archives | Piping Technology & Products, Inc.
PT&P designed and manufactured over 50 variable spring supports for a propane dehydrogenation unit in Texas. The spring cans, rods, welded beam attachments, turnbuckles and clevises are fabricated from hot-dipped galvanized carbon steel. 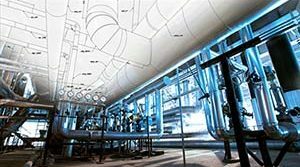 The variables can accommodate an elevation difference up to 11’-5” from the bottom of the steel to the connection of the pipe. They were designed for an operating load of 20,000 lb., a spring rate of 4,700 lb./in. and 0.007” upward movement. Standard load testing was conducted prior to shipping. PT&P custom designed an F-type variable spring supports with graphite slide plates for an oil refinery in California. Each assembly is equipped with round base plates (instead of the standard square plates), and are designed for temperatures up to 700°F. The spring cans are designed for a load range from 420 lb. to 7,650 lb. and movements up to 0.65” up. They are finished with high heat aluminum due to the temperature requirements. O.C. inspections and load tests were conducted prior to shipment. 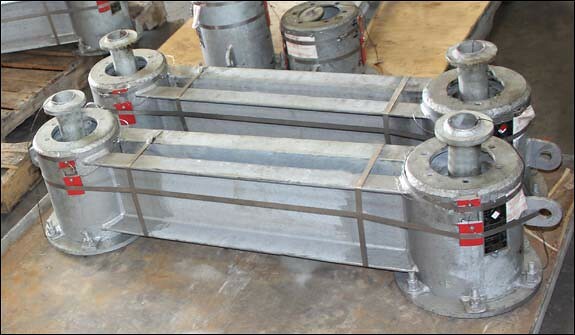 PT&P custom designed and fabricated variable spring supports for a furnace application at a chemical plant in California. The furnace cans are carbon steel and painted with red oxide primer to avoid any potential hazards, where exposed to high temperatures. The springs are designed for an operating load of 1,261 lb., with movement of 9” and dimensions of 6″ x 52″ in length. Load tests were performed prior to a 12-14 week shipment. Piping Technology & Products designed these B-Type variable spring supports with clevis hangers for an ethylene cracker plant in Texas. The variable spring supports, threaded rods, and hex nuts were fabricated from A36 carbon steel and the clevis hangers from 304 stainless steel. The assemblies are 83-1/8″ in length and the spring size is 6-80-B. They are designed for an operating temperature of 800°F, an operating load of 619 lb, and 0.5″ of movement. Standard load and travel tests were performed prior to shipment. 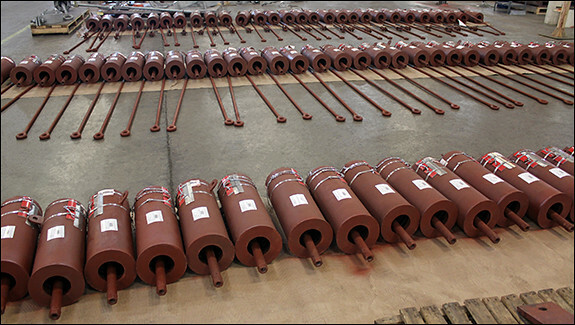 PT&P manufactured these custom variable spring supports for a floating LNG platform in Singapore. The spring housings are fabricated with alloy 2205 duplex and the coil manufactured from – SAE 5160H. 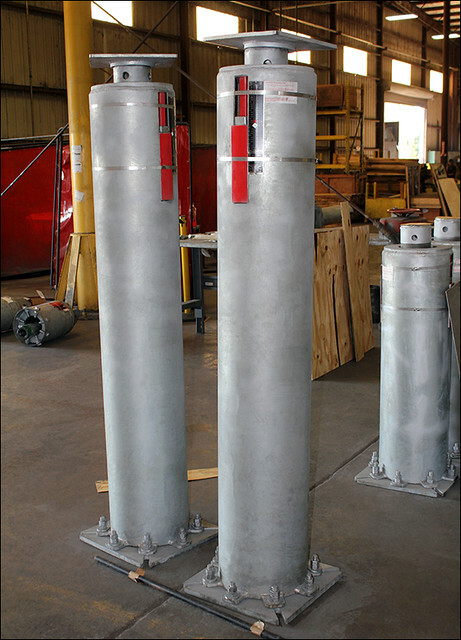 The variables installed heights that range from 10-3/4” to 12–1/16” and are designed for an operating load up to 3,597 lbs. Also load test dye penetrate test was performed operating temperatures of -15°F. These variable springs are also designed to suit a high corrosive environment. They can operate in temperaturs ranging from -14-200°F without compromising its load carrying capacity. PT&P designed two standard PTP-4 size 210 A-type variable spring supports for a Process Power Plant in Oklahoma. The springs are fabricated from A36 carbon steel and with a hot-dipped galvanized finish. The springs are designed to accommodate a Hydro Test Load of 34,000 with operating Load of 31,563 and installed Load of 29,000, movement of 0.82″ downward. A Standard Load and Travel test was conducted on the variables prior to shipment. The springs utilize a rod diameter of 2” and the spring casing 8′ long and 3 1/8” in diameter. View our loading procedure for standard variable springs. See how we test the variable springs prior to being shipped. 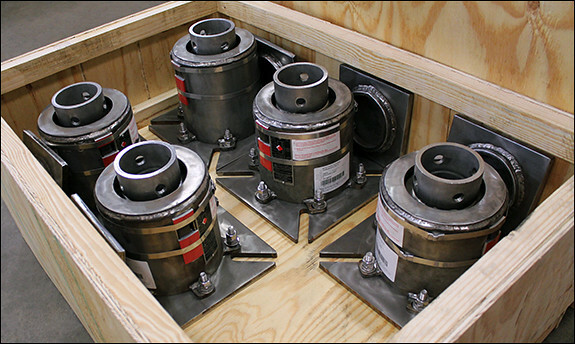 PT&P custom designed variable spring support assemblies for a furnace application at an ammonia plant. 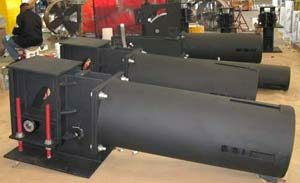 The furnace springs are fabricated from carbon steel and painted with a red-oxide primer to help prevent corrosion. The pipe clamps are fabricated from 304 stainless steel. They are designed to support a cold load of almost 3,000 lb./in. while operating in an area where temperatures are higher than ambient. There were a total of 173 assemblies fabricated for this project, 152 variable hangers, 3 constant spring supports, 6 ball joint rigid struts, and 12 rigid rod hangers. Special load tests were performed prior to shipping. PT&P manufactured variable spring supports for a refinery in Oklahoma. These F-Type PTP-6 spring cans are 70 7/8″ tall and 17 3/4″ wide. They are completely fabricated from carbon steel with PTFE slide plates welded on the load flange and internal guide. They are designed for an operating load of 30,980 lb. .with a spring rate of 2,083 lb./in. and 0.49″ of movement. These variables were hydrotested with a load of 35,000 lb. prior to shipment. 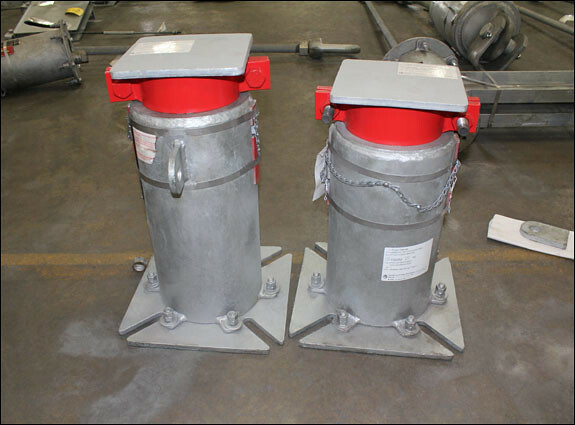 These dual travelers with Type-C variable spring hanger assemblies were custom designed by Piping Technology & Products for valves in a de-coker unit in Texas. All completed assemblies were fabricated from A36 carbon steel with an HDG finish. The travelers range from size 2 to size 4 and are designed for 12″ of horizontal movement. The variables are designed for an operating loads ranging from 1,698-21,756 lbs. PT&P designed these G-Type variable spring support assemblies, along with a 24” pipe shoe and hanger for an oil and gas refinery in Texas. Each item is designed with a center to center of 36” and an elevation difference up to 72”. The spring supports consists of a G-type variable spring, all threaded rod, clevis, lifting lugs, welding lugs and clevis pins. They are designed with an operating load range from 1,700 lb. to 10,500 lb. and a movement range of .02” to .19” up or down. 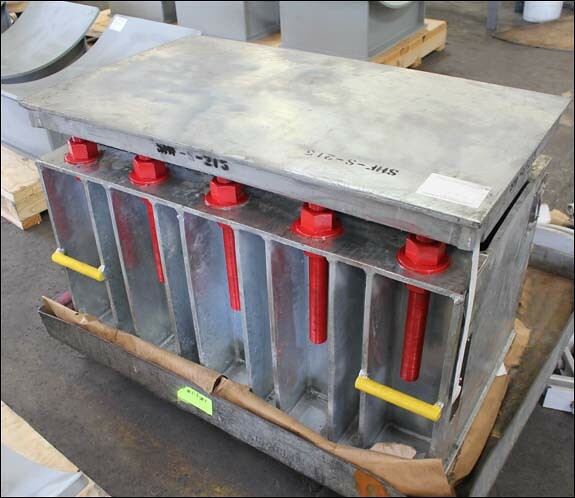 Standard load and travel testing was completed prior to shipment. PT&P manufactured these F-type variable spring supports for a facility in Canada. The springs are fabricated from A36 carbon steel with a hot-dipped galvanized finish. 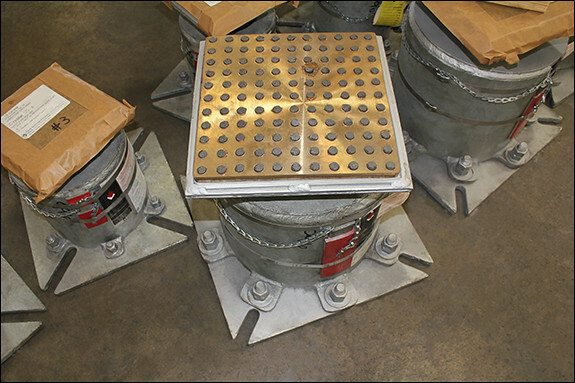 The variables installed heights range from 11″ to 15″ and are designed for operating conditions up to 4,000 lb. Bronzphite® is best suited for high loads, low velocity applications and where the use of oil or grease is undesirable or unfeasible. The bronze plate acts as the bearing surface, withstanding heavy loads, while the graphite inserts provide a solid, oil-free lubricant. As with all of our variable supports, these were quality checked with a 100% spring coil deflection test and a load cell calibration to set the assembly at the prescribed installed load. PT&P designed and fabricated 300 variable spring supports for use in a furnace within a methanol processing facility in Mexico. We manufactured the ”housing” of these variable springs using seamless pipe (in order to prevent the springs’ coils from rubbing against the ”weld seam” of a standard pipe) so that the exact spring rate (+/- 5%) can be calculated without discrepancies or variations. The reason that an accurate spring rate is important is because furnace springs function as a ”scale” in order to determine the weight of the radiant coils within the unit. These springs are coated with red oxide primer to protect against corrosion. 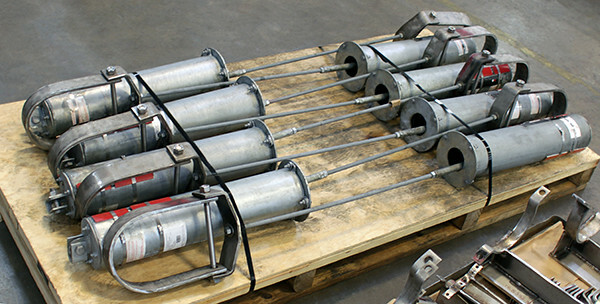 We manufactured these furnace spring assemblies for an operating load of 1,036 lb. and a movement up to 8 1/2″. Each spring is traceable to test data and tagged with its’ unique spring rate along with other standard information use for identification. This Webinar will focus on the different types of variable spring supports and big ton variable spring supports. Learn about the special features available, in addition to the design of a variable support. View how the different coil configurations produce a unique response to an applied load and see how a spring assembly is loaded. Discover the basic steps in selecting a hanger design and the step by step process used to size a spring for your application. Learn about the different attachments, testing, and installation and maintenance procedures. View examples of failed supports provided by our Field Service Division and learn why they failed and how to prevent it. Gain knowledge of the valuable tips used when deciding to replace or re-calibrate a variable spring support, as well as adjustments, shutdown and isolation procedures. PT&P manufactured F-type variable spring supports for a chemical processing plant in Texas. The variables are designed with an internal guide and for a movement of 0.09″. They are designed for a 5,350 lb. cold load and 5,450 lb. hot load. Because these springs had to be capable of withstanding a hydro-test in excess of 33,000 lb. (which substantially exceeded the standard maximum hydro-test of 18,000 lb. ), special collars were used in conjunction with the standard travel stops. 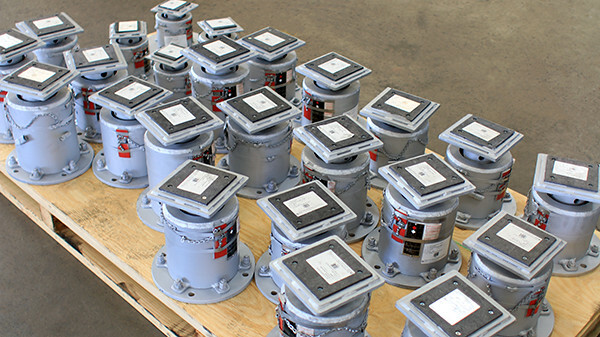 These collars are designed to absorb the large hydro load by relying on the high strength characteristics of the load flange and housing components of the assembly while essentially bypassing the threaded internal components.